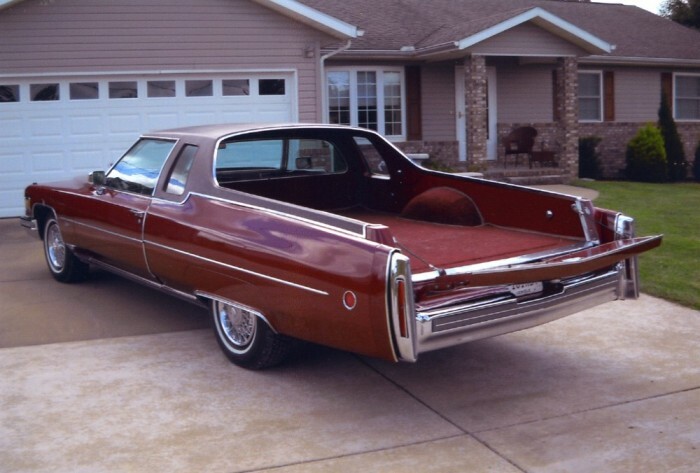 How about a companion to today’s Cadillac Coupe de Ville, one that will haul, regardless of what it has under the hood? wainohg posted this at the Cohort, and it looks like a nicely done job. Or do those quad exhaust tips suggest something potent under the hood? Whatever; its purpose in life is to be looked at, and here we are helping it feel fulfilled. Those ’88-’98(?) GM Stepside beds sure do lend themselves to -aminofication. That big crest on the tailgate looks good! Copies of those pickup beds are churned out here for hotrodders and customisers they look good on most things. I usually point and laugh at PT Cruiser convertibles, but that one looks pretty good in black. I’d agree – a regular box would look better in this instance. The front is all square lines which clashes with the rear’s curvy sort of aero look. Yep. 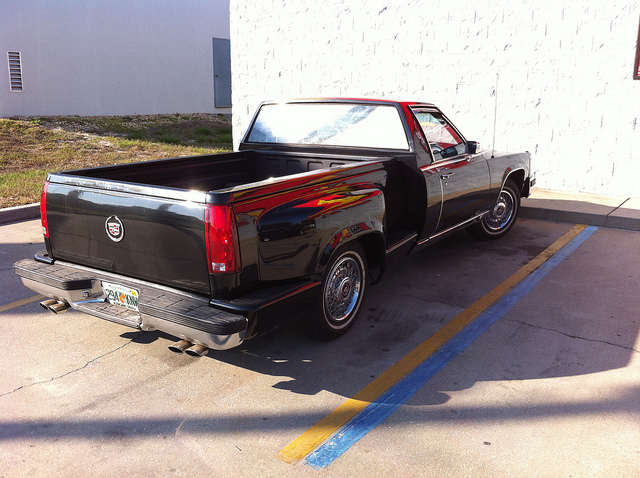 Though it is pretty well done–and I like it–flares just don’t fit in with Cadillac Style. Gotta start out with a 2 door coupe! These 4-door doors are too short. Well, here’s a Eldo-Rampage! FWD Cadrampageo? Anyway the proportions look better! I think it’s real and not a photochop. looks like flower car for funeral home. not really something i would want to go cruising in….dark…. Is this the elusive Coupe de Mino? Nicely done, although I agree the stepside bed doesn’t work even if it was easier. A nice touch is the wheel arch flares done to match the front, just needs the chrome trim strips now. Re: the PT Cruiser convertible, in some of my sillier moments I’ve thought about getting a “GT” Cruiser with the turbo and festooning it with all the ridiculous accessories the make for the PT. Rear tire bulge, woody kit, baby moon hubcaps, and then go after the far too many kids in loud fart can Civics around here. Might leave ’em crying in their energy drinks. @ Dan. Do it with your truck. They’ll probably be squirting the energy drink from their noses. That one and the gold one up the page illustrate one of the major weaknesses of these conversions: it’s damned difficult to get a functional tailgate onto one, and the lack severly hampers using the bed for hauling anything too heavy to easily lift. In that respect the feature car has it all over them. They still make full frame Cadillac station wagons AKA Escalade but there was a gap between it’s introduction for the 1999 model year and the 1996 Fleetwood which was the last full frame car. I don’t get stepsides, from a style perspective. The stepside indentation breaks up the body lines on even the best pickups, and totally destroys this Cadamino creation. With those exhaust pipes there cannot be an HT4100 under the hood. If there is they had better not plan on hauling anything heaver than one trash bag. We had a new Fleetwood in 1982. It was soooo weak. The only gas car I have ever owned with a vacuum pump. Why can’t there be a HT4100 in there because it has dual exhaust? Cadillac also had vacuum pumps on the V4-6-8 368 cars. I take that back it could have dual exhaust and an HT4100 under the hood. It could also have a trailer hitch on the back. You can put a saddle on a sow too. Based on the styling cues, that car looks to be a 1989 model – which originally would have had an Olds 307 installed. Of course starting in 1990 they installed Chevy small blocks 305s and 350s so the engine could easily be swapped. Dropping the bed on the frame would not be particularly difficult but someone did go to a lot of trouble to slice the back of the car off. The professional car builders have had a lot of experience customizing these vehicles so there is a lot of knowledge there with certain people. 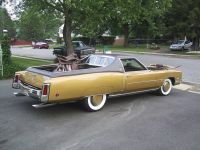 I once had a customer turn a 1973 Cadillac Fleetwood Brougham into an ElCamino like truck he was a professional welder and metalworker so I suppose it was a personal project for him. 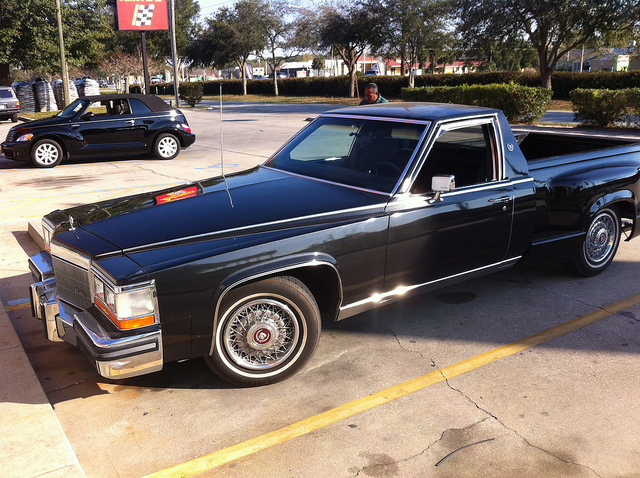 That pickup in one of the above pics looks like a CADILLAC MIRAGE. There was actually a company doing them they were not just one-offs not a whole lot were sold but ostensibly popular among Texans and other wealthy people in the open areas of the country. 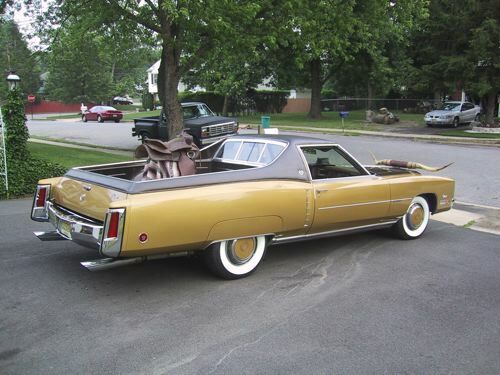 I can’t do much more than add one more echo to the echo chamber about the wrongness of the stepside style for a chiseled, angular Caddy of this vintage. The bed needed to continue the elegant starkness of the front half. Not only do the rear wheelwells not match the front, one pair is chromed and the other is not. The El Camino is frequentl criticized for not knowing whether it’s a car or a truck, but the Automotive Schizophrenia in this one is much more severe: it doesn’t know whether it’s from the 1980s or the 1950s. Which is a shame, as I very much liked this generation of CDVs, and would love to see a well-executed Caminoization. One of these, where the front and rear halves of the body have been intelligently integrated, would be for me a far more appealing high-end Rhinestone Redneck vehicle than the latest megabuck Escalade EXT or Lincoln Mark LT.
A few years ago at a small apartment complex I lived at, just one block from Hollywood Blvd, I shared a parking garage with a black ’77 Eldorado that had been given the Camino Treatment. Esthetically the finished worked better than this one, although I recall thinking that for such an enormous vehicle, and with such abysmal fuel economy, the thing wasn’t particularly roomy either inside (two or at most three across) or outside (a bed noticeably shorter than a real pickup, which really couldn’t haul all that much). But it was quite effective at turning heads, especially in image-conscious Tinseltown.